The Jesus Passages in Josephus. This is part 1 of the translation of my treatise Jesuspassagerna hos Josefus – en fallstudie into English. 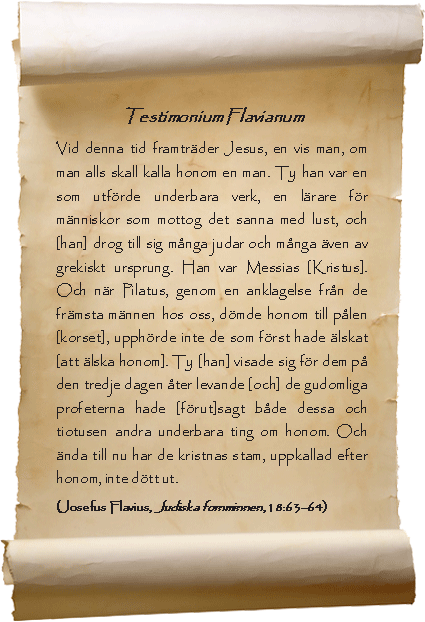 As I publish the English texts, I will also publish the corresponding Swedish texts (this time: Jesuspassagerna hos Josefus – en fallstudie, del 1 – Sammanfattning och biografi) taken directly from the article found here. Two references to Jesus of the Bible found in the Jewish historian Flavius Josephus’ Antiquities of the Jews from 93/94 CE, are considered to be the paramount non-Christian witness to Christianity’s most prominent figure. For a long time there has been an active debate regarding the authenticity of the two passages. This thesis argues that Josephus did not write anything at all about Bible-Jesus. The longer description of Jesus’ achievement, called the Testimonium Flavianum, is at first quoted (in the same wording as in all manuscripts of the Antiquities of the Jews) by the Church Father Eusebius of Caesarea in the early fourth century. The three deviating versions which exist, Jerome’s Latin from the year 392, Agapius’ Arabic from the year 942 and Michael the Syrian’s Syrian from 1173, differ on a few points, primarily by a less absolute designation of Jesus as the Messiah. But they all rely on Eusebius’ and not Josephus’ account, and it is perfectly reasonable that they themselves, or their source text, has modified the text. An early Latin paraphrase of the Testimonium Flavianum does not necessarily either indicate that the paragraph was in another wording in Josephus before the time of Eusebius. The overwhelmingly Christian praising of Jesus, which is incompatible with Josephus’ Jewish stance, and the total lack of interest for the Testimonium Flavianum which the Fathers show before Eusebius quotes the passage (and also partly in the century thereafter), would militate against the concerned paragraph appearing in Josephus’ original text. This, combined with the fact that the Testimonium Flavianum does not fit into the wider context of the Antiquities of the Jews, makes it unlikely that the text was written by Josephus, and was in the book from the beginning. In order for the second reference, the one about “Jesus, who was called Christ” in a subordinate clause in connection with the death of James, to reasonably have been written by Josephus, Testimonium Flavianum ought to be authentic – which it accordingly does not seem to be. Without the Testimonium Flavianum and hence an earlier identification of whom Jesus Christ was, this sketchy explanation by Josephus of which Jesus he had in mind, deviates from his usual way of identifying those people he introduces in his writings. To this can also be added that Origen in the mid third century was aware of another passage in Josephus on James and Jesus with identical wording in part; a passage which probably was a Christian interpolation. It is therefore a most reasonable conclusion that also the reference to Jesus in the James passage is a later addition to the text Josephus originally wrote. Thus Josephus would not have testified to Jesus at all. Those who wish to read an overview of this thesis’s content and conclusions, will find such a summary published in a previous post: The Jesus passages in Josephus – IV. Conclusions. This study of the two Jesus-passages in Josephus is meant to both in depth and width highlight the issue of their alleged authenticity. The subject is comprehensive and there are many stones to turn over. I would therefore like to emphasize that this thesis, like all previous ones (and unless new material emerges also all future ones), not necessarily will determine how things are; if Josephus wrote or said anything about Jesus. As scholars adopt so many and such varied attitudes regarding what is real and not, and as the reasons to why they believe what they believe are so many, it is difficult to argue for or against every individual position. For reasons of clearness I am therefore obliged to focus on the source material which I have judged to be essential and on such objections as might be deemed relevant and crucial in this context. I therefore only intend to highlight all the essential materials and as a result of this argue for my position, which is that it is unlikely that Josephus wrote anything at all about Jesus of the Gospels. The by far most famous ancient Jewish historian is Josephus Flavius. His real name was Yosef Ben Matityahu (Joseph son of Matthias), and he was born in Jerusalem in the year 37 or possibly 38 CE. He is accordingly a Jew by origin. The only actual information about his life originates from his own writings, and then essentially his autobiography. This Life is like much else of what Josephus wrote highly polemical and coloured by the accusations of treason against his own Jewish people and brutal conduct in connection with the Jewish-Roman war 66–70, which particularly another Jewish historian, Justus of Tiberias, accused him of. A marble bust that possibly depicts Flavius Josephus. The bust has no identification marks and the identification was made by Robert Eisler on the basis of Eusebius’ claim that Josephus as the most famous Jew of his time had his statue in Rome, as well as that the person according to Eisler looks Jewish. The bust is now at the Ny Carlsberg Glyptotek in Copenhagen. According to his own writings, Josephus was a descendant of a Jewish priestly family where his mother was of royal blood. Josephus studied to become a priest. When he is sixteen year old he decides to evaluate the three Jewish “philosophies”, the Sadducees, the Pharisees and the Essenes. He claims to have spent three years in the wilderness with the Essenes and at the age of nineteen he is ready to make his choice. He returns to Jerusalem and joins the Pharisees, an ideology he remains faithful throughout his life. When the rebellion breaks out in Palestine in 66 CE, Joseph is designated as commander of the revolutionary forces of Galilee. But already in 67 CE he is captured by the Roman general Vespasian. For some reason he manages to win Vespasian’s trust – he himself claimed that it was because he predicted that Vespasian would become emperor of Rome, which he indeed also became in 69 CE – and Joseph is released from his captivity. Without much success Joseph tried to mediate the siege of Jerusalem. Among other things, by urging the Jews of Jerusalem to surrender, many Jews have come to regard Josephus as a traitor of his own people. In 70 CE Jerusalem falls to the Romans and the fate of the Jews is sealed. Vespasian adopts Joseph to his large family, known as the Flavian dynasty, and Joseph took the Latin name Josephus Flavius (Latin: Flavius Iosefus). He follows General Titus (son of Emperor Vespasian and the future Emperor) to Rome where he will spend most of his remaining thirty years. In Rome, he writes the Jewish War in Aramaic (completed no earlier than 75 CE); a depiction of above all the war he himself had participated in; and assisted by others he also translates the work into Greek. That work is done by 78 CE. He then begins to write the next great work of history, Antiquities of the Jews. In this work, which he probably writes directly in Greek, he deals with the Jewish history from the antiquity up until the year 73 CE. Antiquities of the Jews consists of 20 books and is published in 93 or 94 CE. Here Josephus reiterates much of what he had written earlier in the Jewish War, so also the description of the religious movements and the prophets of Palestine. It is in this latter work we find two references to the Bible-Jesus. There are two further books by Josephus preserved; Against Apion, which he finished c. 97 CE and his autobiography, Josephus’ life, which perhaps was published in 99 CE: Josephus is believed to have died sometime in the very beginning of the second century. Flavius Josephus, The Jewish War, preface 1; Life 1–2. Flavius Josephus, The Jewish War 4:622–629 or 4:10:7; Against Apion, 1:9–10. In Greek: ”Περὶ τοῦ Ἰουδαϊκοῦ Πολέμου” or ”Peri tou Ioudaikou polemou”. In Greek: ”’Ιουδαϊκὴ ‘Αρχαιολογία” or ”Ioudaikê Archaiologia”. According to Josephus his work was completed during the thirteenth year of Domitian’s reign (Flavius Josephus, Antiquities of the Jews 20:267). This corresponds to sometime September 93–September 94. In Greek: ”Ἰωσήπου βίος” or ”Iôsêpou bios”. Correct me if I’m wrong, but isn’t the earliest copy of Origen’s remarks on that passage embedded in Eusebius’ Ecclesiastical History? I have read that Eusebius was known as a notorious liar who wouldn’t hesitate to falsify history to advance the cause of the catholic church. I will deal with this later on, but that is correct. Eusebius reproduces the same sentence and with identical wording as Origen does in Against Celsus 1:47. Since Eusebius also reproduces the sentence from Josephus, it is likely that Eusebius simply was copying from Origen, because he used Origen and also does not say where Josephus should have written this (like Origen, who also does not say where Josephus should have written this). Yes, and I’m wondering if Origen just made it up and after Constantine reinvented Christianity in 325 CE the authorities could gather up all copies of the works of Josephus and have Eusebius judiciously ”transcribe” them, that is, edit them to add the (in)appropriate verbiage. Or maybe Origen’s remarks didn’t exist before Eusebius invented them! And are you aware that Tertullian in the 3rd Century said there was similar language to the Testimonium Flavium in the Jewish War? Where does Tertullian claim this? I did not think the TF has been attested this early. We don’t know Tertullian actually said this. This could be putting words in Tertullian’s mouth long after he passed on. This link above has all the antenicene mentions of Josephus. And I don’t think any of them are genuine. I don’t trust Eusebius as far as I can throw him! The link below leads to a thread wherein I found the Tertullian mention of a Josephan mention of ”Jesus” in the Jewish War. I found the mention in one of the following pages of the thread not the first page that I linked to, sorry. And if I recall correctly, the Josephan mention in the Jewish War is present in a Slavonikan version (Hegesippus???) and not the western version; otherwise, the Christian apologists would have been all over it! You see how problematic this is! To me, all mentions of an historical Jesus outside of the New Testament are the results of Christian interpolations (forgeries). OK I was able to dig up more info on it. This post of the thread I linked has a link to a mention of the TF in The Wars of the Jews at Tertullian.org: which has Agapius quoting The Jewish War but it’s really from Antiquities of the Jews because the language is too obvious. And the exhaustive reference for all references to Josephus by the antenicene fathers has the mention of ”James, brother of Jesus (called Christ)” which was either a lie by Origen or was put in Origen’s Contra Celsum by Eusebius, who (or a later scribe) also stuck it in Ant. Jews. Post 46 of the same thread points out that Agapius was using Eusebius, an extract of Eusebius or found a different (forged by Christians) TF. More discussion in Post 47, Post 48, Post 49 and Post 50. I thought I found something by Tertullian. Looks like I got him confused with Tertullian.org! No, I wouldn’t say so. Agapius (in 942 CE) is in all likelihood relying on a Syrian text which is based on a Syrian translation of Eusebius’ HE. I will deal with this later on in my study. My respons was to your previous post. Thanks. Not remembering something correctly, I led you up a blind alley. Mea Culpa. The bust, claimed to be that of Josephus, looks like the images on coins and other sculptural portraits of Elagabalus/Heliogabalus*, the short lived 3rd century Roman emperor. There is absolutely no good reason to claim that the Ny Carlsberg Glyptotek image is a portrait of Josepus except for an unsubstantiated assertion made by Eisler that no one has strenouosly challenged. Well the lips are a bit thinner and there’s a hook to the nose that Elagabalus doesn’t appear to have; otyherwise DBlocker could be correct!